Digoxin is useful in treating patient with atrial arrhythmias or patient with left sided heart failure.Digoxin will increase the contraction of the myocardium. Digoxin is part of the cardiac glycosides along with digitoxin. Digoxin will acts by inhibiting and blocking the NA+/K+ ATPase pump of the cardiac myocyte cell membrane.There will be an increase in the intracellular contraction of the sodium ion which will lead to inactivation of the Na+/Ca2+ exchanger. This will finally lead to an increase in the intracellular Ca2+ which cause an increase in the contraction of the cardiac myocyte. Digoxin may also increase in the parasympathetic outflow which later lead to a decrease in the heart rates. Digoxin will react at the sinoatrial node and atrioventricular node. Patient may also suffer from digoxin toxicity. 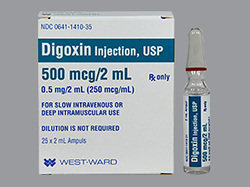 Digoxin toxicity is treated with administrating the digoxin immune antibody / anti- dig fab fragments. Patient need to stop from taking digoxin. Digoxin may carry its own side effects such as cardiac arrhythmias, yellow blurry vision and gastrointestinal discomfort. Digoxin may cause changes on the ECG such as decreased in the QT interval, T wave inversion and prolongation of the PR interval as well as scooping of the ST segment. The side effects of the digoxin is getting worst with hypokalemia, renal failure and quinidine. Renal failure may lead to difficulty in excreting the digoxin. Hypokalemia may lead to digoxin and potassium ion competing to bind to the Na+/K+ATPase. Quinidine may replace the binding of the digoxin from the albumin which increase the level of digoxin in the serum.